The Japanese central bank (the Bank of Japan) shocked markets last week when they announced they will be increasing the size of their current quantitative easing program. They will increase the amount of money they are printing monthly to 80 million yen, which is equivalent to 700 billion US dollars. With the Federal Reserve (U.S.) and Bank of England (U.K.) currently on hold with their QE programs, the European Central Bank only just beginning the process of putting their next QE program together, the Bank of Japan has taken center stage in the global currency wars. To help put the extraordinary size of Japan's QE into context, you must look at it relative to the size of their overall economy. If the bank of Japan were to print $1 billion and send it to the company Apple, they would probably not even notice. If they were to print $1 billion and send it to someone reading this site, it would most likely change their life significantly. An equally sized QE program relative to GDP in the United States would be $3 trillion annually. 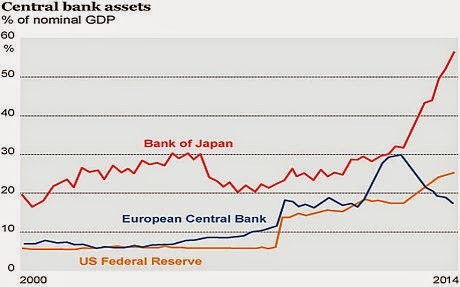 The Bank of Japan already owns 25% of all Japanese state bonds and its balance sheet will increase by a size equal to 1.4% of Japan's GDP every month. The Japanese Pension Fund recently announced they would be reducing their holdings of Japanese Government Bonds from 53% of their portfolio to only 35%. The Bank of Japan will essentially step in and buy every bond that is sold from the pension fund and then some. What will the Japanese Pension Fund do with its new cash? They will buy stocks by increasing their foreign and domestic holdings to 50% (25% each) of the portfolio size. In order to reach these targets the Pension Fund will need to purchase $90 billion of Japanese equities and $110 billion of foreign stocks by June of next year. Stocks markets around the world rejoiced on Friday. If you lend your money to the Japanese government for 5 years they will provide you with a return of 0.11% annually. Essentially they will provide you with nothing. What could possibly go wrong? I don't even know where to begin. This means that while Japanese investors are receiving between 0.02% to 0.45% on their government bonds (almost all Japanese debt is held within their borders unlike the U.S.), their cost of living is rising by 3.2% annually. Monthly expenses are only one side of the equation. Unfortunately, when we look at real wages in Japan they are also plunging. 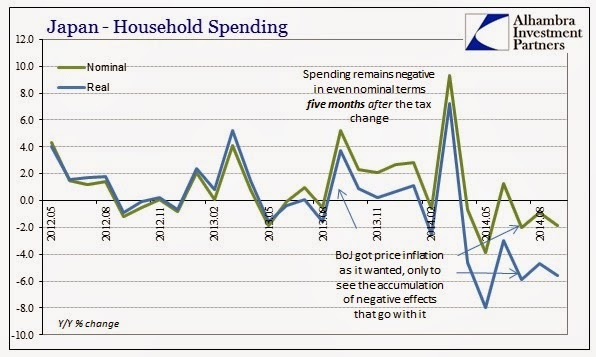 When you add a rising cost of living and falling wages with the massive tax hike announced earlier this year you have a collapse in household spending, which has fallen for six straight months. Japanese is currently running at 250% government debt to GDP. The debt burden has grown so enormous that if interest rates were to rise to about the 2% level on government bonds, it would consume 100% of the revenue the government takes in annually. When you include the corporate, household and financial sector, total debt to GDP is over 600%. By promising the financial markets that they will not stop QE until they reach 2% inflation, they are essentially promising the markets they will lose money if they hold government bonds below that interest rate. This is why the government pension fund is selling its bond holdings rapidly (and every other rational entity or person on the planet will soon follow). The Bank of Japan understands that rising rates will cause Japan to immediately self destruct so they stand ready to print an unlimited amount of money to keep rates low. The problem with this strategy is that inflation is not something you move up and down like a thermometer. 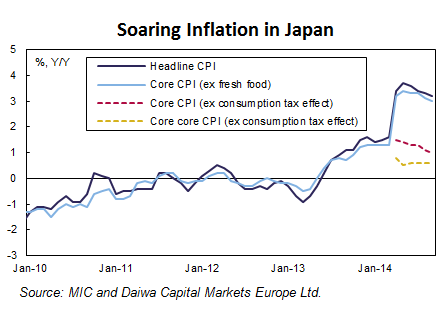 When core inflation hits 2% it will most likely continue higher and it could begin to move higher at a very rapid pace. This could occur due to a rapidly fallen yen which would cause import costs to surge for Japanese citizens (Japan currently imports almost all their energy needs due to the shut down of their nuclear reactors following Fukushima). The yen has fallen by 40% since mid 2012 against the dollar, euro and Korean won. It is down 50 percent against the Chinese yuan. When the yen breaks there be a flood of Japanese government bond sellers who are getting crushed by holding bonds at low interest rates combined with high inflation. In order to stop inflation and a falling yen from spiraling out of control the Bank of Japan would have to raise rates and sell bonds. 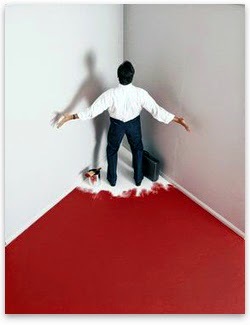 If the only buyer becomes a major seller you will see interest rates skyrocket. Japan has painted itself into a corner. Japan will be the first major developed market to see their sovereign debt market implode and it will mark the next chapter of the sovereign debt crisis. During this stage market participants will see the negative effects of quantitative easing (the hangover) at the same time they witness the impotence of central bank's ability to stop a currency crisis. If I lived in Japan I would be 100% diversified away from the yen, and I would be very concerned about a coming banking and economic crisis. 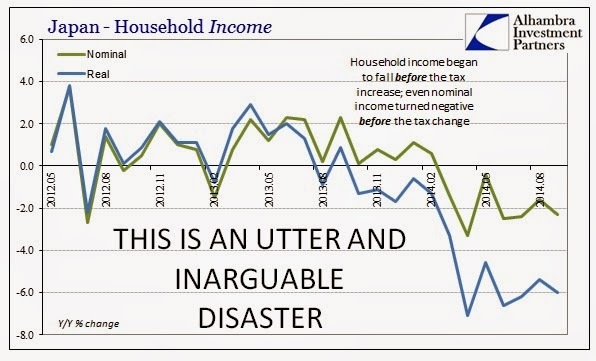 It will be devastating for most of their citizens who do not escape the tragedy in time (financially). My hope is that policy makers around the world watching the horror unfold will learn from the mistakes Japan is currently making and change course in time to avoid the worst case scenario within their own borders. 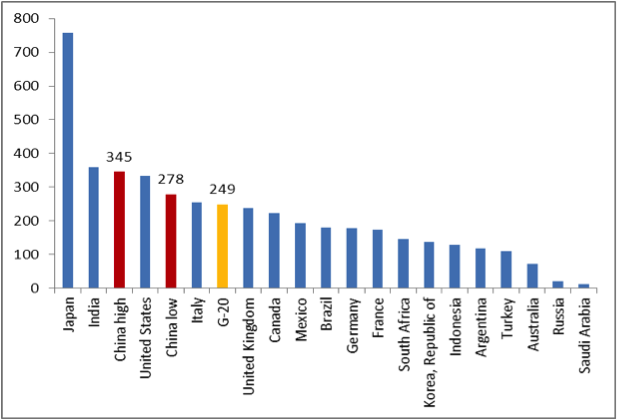 While Greece is a spec of dust within the global economy, Japan is responsible for 5% of all economic growth. The collapse of their currency and bond markets will send earthquakes throughout the financial system.